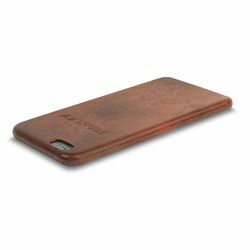 The STANLEY Leather Case for iPhone 6/6s is made from premium leather, adding protection and style without the bulk. The case includes a microfiber lining on the inside to guard against scratches. 100% NATURAL LEATHER - Crafted from premium leather, each case features a rich, natural appearance with a soft and subtle texture. PLUSH MICROFIBER LINING - Inside the case, a layer of soft microfiber cushions your phone and protects the surface from scratches. EASY BUTTON ACCESS - Precision craftsmanship ensures the case does not interfere with the functions of your phone with cut-outs for the camera lens and power button and with reinforced panels for volume controls. CRAFTED for iPhone 6 Plus/6s Plus.